My very patient wife was starting to get pretty annoyed after about half an hour of me driving around trying to find a parking lot at the base of Mount Washington that didn’t have a barrier gate. The North American market “NMS” Passat first appeared on the market in 2011 as part of VW’s plan to sell 800,000 vehicles per year in North America. Since then, it had a mild facelift in 2016 and gets a new engine for 2018. So how’s it holding up? Come on in for my impressions or just look at a big stack of photos! While I was setting up this photo a lady in an ancient rusty Chevy Cavalier drove by multiple times trying to parallel park, failing, and giving up only to go around the block and repeat the process. I think she still may be doing circles on top of Mount Washington. Full Disclosure: Avis upgraded my “Volkswagen Jetta or Similar” to a Passat to give me a chance to review it, because they knew that I had rented a Jetta from them in the past. Actually that’s not true and I have no idea why I got a Passat after reserving a Jetta. I also paid for the rental and gas, though I did rent through Costco and used a coupon that got me 5 days for the price of 4! Replacing the B6 Passat in North America (and China) this “NMS” (New Midsize Sedan) Passat is different than the B7 and B8 Passat that the rest of the world got. In an effort to sell more cars in North America, VW decided that the car needed to both bigger and less expensive. To help keep it affordable, a new factory was built in Chattanooga, Tennessee just for this car (it now builds the Atlas as well). The result is a vehicle much more in line with segment stalwarts like the Camry, Accord, Sonata, and Malibu than the previous generation Passat. This station sells natural gas, hence the name. Along with the NCS “New Compact Sedan” Jetta, VW’s plan to increase sales seems to have worked, much to the chagrin of enthusiasts who appreciated VW’s former philosophy of emphasizing driving dynamics over price points. I don’t think they quite reached their 800,000 units goal, but the NMS has sold much better than the B6, reaching over 500,000 sales so far. In 2017, the NMS had its lowest sales tally in the US at just over 60,000, still beating the best year of the B6 - 55,000 in 2006. It’s easy to forget now that it has been around a while, but this NMS actually was very well received when it was new. It was Motor Trend Car of the Year. It won Car and Driver comparison tests in both optional V6 and base 5-cylinder (vs. 4-cylinder competition) form. The TDI was a unique option in the segment. Since then, however, we’ve had Dieselgate and just about every competitor has been redesigned - so what is the Passat like in 2018? To find out, I picked up a nearly brand new 2018 Passat R-Line with just 700 miles on the odometer from Avis at PIT. I had it for five days and mostly used it to run errands around the horrible roads of Pittsburgh in a mix of rain, snow and sunshine. From this angle, I think it looks a lot like an Accord. This particular Pure White Passat is an “R-Line” trim. Much like the Accord Sport trim that sits between the LX and EX, this model adds some “sporty” cosmetic tweaks without much performance benefit and sits between the base S and mid-level SE trims. Starting at $24,995, just $2,000 more than the S, the R-Line adds unique front and rear bumpers, handsome 19" wheels (vs. 16"), V-Tex fake-leather seating (vs. cloth) and steering wheel (vs. rubber), dual-zone automatic climate control and VW’s driver assistance package (itself a $495 option on the S). Honestly, I think that’s a pretty good deal for the price increase. This car did not have the only option available on the R-Line - a $1,195 LED lighting package, leaving the total MSRP at $25,845 with destination. All R-Line’s are a 2.0T/6-speed auto combination (more on that later). Moving up to the SE is required to get a sunroof and keyless ignition. All these people taking pictures of the city on a rare sunny afternoon and I’m over here taking pictures of a rental car. There isn’t a whole lot to say about the exterior of this car. It’s big and bland to the point of anonymity. I tend to think that it looks good, although to not exciting. To be fair, VW has a long history of simple designs before they started to get more creative in the early 2000's, so in a way, this is a throwback to that era. So new it was still sporting temporary registration in the window. The R-Line trim (introduced in 2016) takes a few cues from the MkVII GTI - in particular the front fascia with its puffed out lower “intakes” and horizontal strakes. The rear gets a shiny black plastic valence that looks nice without being filled with fake vents in the name of being “sporty” like some competitors (looking at you Toyota). The wheels, with their typical VW lug bolts instead of nuts, look fantastic. I really do like these wheels. VW does a good job with wheels in general and the lug bolts really help keep the overall look clean. The wheels do highlight the other thing you can’t help but notice about this car - it is large. The 19" wheels on the R-Line look just big enough. The base 16" wheels look almost comically small. When 16" wheels look tiny, you know you have a big car. It is within an inch or two of all of the other midsize competitors in all dimensions, but visually it just looks more massive. One other thing that I noticed is that the body seems to sit slightly lower than other midsize cars. I had to be careful to stop short of typical concrete parking stop blocks that appeared to be tall enough to scrape the front fascia. At one point I parked next to an Optima that cleared a parking stop just fine that the Passat would not. Sorry for the scribble - I just realized last minute the plate was still there and made a quick fix. Look - a real handbrake in 2018! Let’s face it: even the best looking midsize sedan isn’t going to end up in a museum. The inside of the car is what you spend far more time looking at and it’s important that it be functional, comfortable, and something you don’t mind looking at. Once again, VW has erred on the side of simplicity for the interior styling and layout. The dashboard is about a plain as it gets in this class. Like the exterior, I don’t really mind it. VW clearly has kept with their typical design cues and it is instantly recognizable as a VW inside. It is boring, but the looks should hold up well over time - I’m not sure I can say the same about the weird vent shapes on the Fusion or fabric-coated dashboard on the Malibu, for instance. It did seem rather dark - pretty much everything is black inside the R-Line. The headliner is gray and kept it from feeling completely like a coffin. Other trims can be had with brighter interiors. My Patagonia Black Hole duffel is not small. Packed full, it is holding close to 40 pounds of clothes and I’ve lived out of it for over a week at a time. I could’ve fit at least six of them in there. Let’s start the interior tour at the back of the car and move towards the front, because that’s how VW seems to have designed this thing. And that means the trunk. Which is enormous. Yes, a lot of cars in this class have big trunks, but this one is basically your own personal dragon’s lair cavern. We had a ton of leftover food after having a banquet catered for 35 people and getting around 26. All those trays and cups in the photos below filled maybe a third of the trunk at the most. Shout out to Calabria’s on PA-88 in Castle Shannon, PA who did an awesome job with our event. That huge trunk can be expanded even further using the 60/40 split rear bench. The seatbacks are released with pulls located at the top of the trunk opening, which is convenient. Disappointingly, however, they don’t seem to actually flop the seats down when you pull them like in some cars. Instead, you either just push them down with whatever you’re putting in the trunk or pull them from the rear door opening. I think it would’ve made more sense to just put the releases on the top of the seat cushions next to the headrests like Subaru does. A thing rarely seen these days. There is no ski passthrough in the center on the R-Line, though higher trims get one. There is one more thing to mention about the trunk though: the floor isn’t flat. The center area actually sits a little higher than the space rear of the wheel wells. A removable plastic divider is provided to keep things from rolling into the low spot on the left. The reason for this odd floor choice is that the Passat actually has a spare tire! It seems like fewer and fewer cars are coming with spares at all these days, opting instead for run flats or tire slime kits. It is a temporary donut spare, but it is better than no spare, so it is nice to see here. Don’t let the flat bench fool you: this is a nice place to be. Moving forward of the trunk, we arrive at the back seat. This really is the Passat’s party piece. The back seat is huge and comfy. On the R-Line, the seats are trimmed with VW’s excellent V-Tex vinyl. I’ve sat in plenty of fake leather seats in the past few years and VW does it about the best of anyone. Although the seats don’t have much of a contour to them, they are very comfortable. The foam is a grade above typical midsize sedan fare. There is an initial give and squishiness, but them it firms up before you sink too far. We loaded up the back seat with three passengers for a trip over some awful road surfaces and received no complaints. The rear seat of the Passat holds no less than 9 potted plants. Of course, the seat materials weren’t the only reason there were no complaints. More importantly, the back seat is simply huge. I’m 6'2" and with the driver’s seat set for me there was room behind it for me to sit and cross my legs. I thought the Camry had a big back seat, but the Passat has even more space. Compared to the Optima I rented a few weeks before, the Passat seems like a limousine. It also holds lots of plants. About the only thing missing in the back on the R-Line are rear climate vents, made obvious by a storage cubby where they should be. Higher trims do get rear vents in that space. Also, while materials that you touch are good, the rest of the plastic is pretty cut-rate. While it is about par for the course for this class when the car came out, feels out of place now. Worse, in my opinion, is that it is a definite step down from the materials used in global VW models like the Golf that we get in the US. Moving forward again, we reach the front seats. Up here, things are a bit of a mixed bag. Let’s start with the good. While the drivers seat is severely lacking in bolstering department, it is comfortable and a good driving position was easy to find - something that I can’t say about, for instance, an Optima. The aluminum trimmed pedals on the R-Line are nice, even if they have no functional advantage. There are auto headlights standard, which is a nice thing to see at this price and trim level. What I liked most, however, is the short dashboard top. It almost feels like a throwback to midsize sedans of the 1990's. Compared to the Optima, Fusion, Sonata, and especially my own Outback, the short dash top and tall, upright glass make the car incredibly easy to see out of by modern standards. This Passat did have the drive assistance package. It provided what have become pretty typical features in the last few years - blind spot detection and forward/rear collision warnings. They work pretty well. The blind-spot system is the usual light in the wing mirrors and all systems can beep at you if they think you are about to do something to crash. It became pretty annoying when I was trying to back out of a cafe parking lot onto a four-lane road, beeping that things weren’t clear when the far lane was the occupied one. It also has radar set-the-distance cruise control. I didn’t end up using it, because these systems have become so common now that I’m not entertained enough to just try them for the sake of it out anymore. So many blank buttons reminding you that the R-Line may look fancy on the outside, but it definitely isn’t the top trim Passat. You also get a few other nice perks up front. The dual-zone automatic climate control is something that is becoming common at this price point, but not standard yet. In the Passat it is simple to use and worked well. The “MAX DEFROST” is a great feature that I haven’t seen on too many cars and it was quite welcome when I pulled out of the airport rental garage into misting, just-above-freezing weather. The heated seats were also some of the better ones that I’ve sat in: they warmed up quickly and could get way hotter than I was comfortable with on the highest setting. It took me an embarrassingly long time to discover that trunk release button on the driver’s door. Locks are the typical VW configuration of no physical switches with a light indicating the locked/unlocked status. The inscrutable power mirror adjustment is one of the worst I’ve ever used. The center console bin can swallow quite a bit. And... that’s about it for the good things. There were also some bad things. Starting with the obvious: the steering wheel. It’s terrible. Flat-bottomed wheels do not belong in midsize sedans. It isn’t just an R-Line thing either - all 2018 Passats get a flat-bottom wheel. The material on it was terrible was well. It’s a sort-of soft, slippery leather that feels like a really cheap imitation of the fantastic stuff BMW uses on their M-Sport models. The stitching is similar: it mimics the complex stitch patterns that BMW and Audi use, but it is thin thread that was loose and moved around whenever I touched it. I don’t have a lot of faith in it lasting very long. The glovebox is a decent size, but missing the climate pass-through that the Golf has. Hard to see here, but the center console bin does have felt at the bottom. The door pockets, however, do not have felt lining. The door pockets in the Golf do. Cheapness abounds all over the dash. The shiny “piano black” trim is a played out trope at this point and the fake aluminum accents aren’t much better. As I said earlier, I don’t mind the design style, but the materials aren’t good. Injection molding seams abound and there is no felt in the door cubbies, though there is at the bottom of the center console storage compartment. The gauges are easy enough to read, but I didn’t really care for the design. The multi-function screen between the speedometer and tach is the same low-DPI black-and-white unit that VW has been using for ages now. It works well enough, but just about all of the competition has nicer screens now. Disappointingly, wiper status is not displayed there. Kia, for instance, shows a graphic on their gauge cluster screen of the position of the wiper stalk and setting temporarily whenever you adjust the wipers. This is great to have on rental cars and just a nice thing in general that is missing on the Passat. I do like the red backlighting, but I own multiple Subarus so I’m probably biased. April snows bring... what that’s not how it goes is it? One thing that really bugged me is that the R-Line still uses and ignition key. Yes, higher trims get push-button start, but that is one missing feature that really feels like cost-cutting gone wrong. Push-button start has been becoming standard in this class for years now - it was on the Altima back when this Passat came out. Even VW’s own Golf has push-button start on the base S trim. The backup camera is pretty bad. This was just a mist outside with the wipers on the lowest intermittent setting and the picture became unusable. The infotainment system is OK. The screen is bright and clear and high-enough resolution at this price point. The system was a bit overly complicated, but at least it responded fairly quickly to inputs. The stereo quality is surprisingly decent for this price point - higher trims have even better optional sound systems. The switch to daylight saving time occurred while I had this rental. Oddly, the clock is set with small buttons next to the gauges rather than on the infotainment system in the center. Finally, we need to talk about the backup camera. It’s terrible. With even a light drizzle it gets so coated in water that it is rendered useless. When it was clean and lighting good, it still was a bad, low-resolution picture. Under the hood is a 2.0L turbo engine. No, not the one you are thinking. Let’s get back to the engine that was mentioned earlier. For 2018, the Passat gets a 2.0L turbo, an increase in displacement from the 1.8T that was used for the past few years (itself a replacement for the 2.5L inline-5 that was the base engine when this Passat debuted). So it’s the GTI engine, right? That should be pretty fun, right?! Not so quick. It is a version of the venerable EA888 motor, but it has been modified to run a variation of the Miller cycle. Power is 174 hp, just 4 more than the outgoing 1.8T. Torque is 184 lb-ft, the same as the 1.8T. From 1,500 RPM... also the same. So what’s the deal? Well, it should be more efficient. It’s almost like a “reverse VTEC” where the “hot” profile is actually just normal and the other is for efficiency. Tracy talked about it on the FP awhile back, so if you want to know more, check that post out. Despite the GTI design cues, the Passat moves leisurely. Anyway, it moves the car. I noticed that I did have to give the Passat quite a prod to really get it going. 0-60 happens in over 8 seconds. Most of the 4-cylinders in the class do it in the 7's now. Overall, it just felt sluggish. The 1.4T Jetta is probably just as slow, but feels peppier, perhaps just due to more turbo lag drama. The engine doesn’t make particularly good noises either. It just kinda groans and slowly accelerates the car. VW still offers a 3.6L VR6 for those who want to go quicker. This motor gets the job done, but it certainly isn’t exciting. I didn’t bother to measure fuel economy, so I don’t know if it was all that efficient. The Passat’s EPA rating is still a few MPG low for the class, so don’t expect this new motor to be some sort of TDI replacement as a trade off for losing over 40 HP compared to the version in the GTI. I think the Passat would be a lot more fun with around 200 HP, but it doesn’t make sense given the optional V6. Apparently the R-Line badge thing on the fender is called a flitzer. This style started on the GTI and VW has been spreading it across the range over the last few years. The transmission is also a thing that exits in the Passat. It is a conventional automatic with six speeds and it is dreadful. The transmission sucked all the fun out of trying to drive briskly. In fully automatic “D” mode, it shift slowly, and is slow to kick down when you ask for power. The manual “S” mode you can shift with the gear selector or buttons on back of the the steering wheel spokes (I wouldn’t really call them “paddles”). Shifts are still slow and slow to happen when you ask for them. It will at least hold onto revs for longer. I tried the manual mode for a few minutes and gave up. If you just use the car to run errands it is fine, but there is absolutely zero sportiness (or joy) to be found in this drivetrain. All plants arrived at their destinations unharmed. If you’ve driven a German-engineered VW like the Golf/GTI in the last few years, then you’re probably familiar with their almost magical ride that is firm without being harsh. That isn’t quite the case here. I’m not sure if it is just the R-Line (or its 19" wheels), but this Passat is definitely on the firm side of things. Unfortunately, it isn’t quite the nice firm that the Golf has. The suspension is very busy and I always felt it clattering away doing something. Harshness does sometimes seem into the cabin and it crashes over expansion joints and cracks in the road that other midsizers soak up without drama. I’ve driven my dad’s Camry over these same roads many times and it is much smoother. It isn’t exactly bad, though. The cabin in pretty hushed in general, and not much noise from the suspension comes through - you feel it rather than hear it. The tradeoff is that body roll is controlled better than average for the class. Potholes like these should be avoided in the Passat even more so than other midsize sedans. The controlled motions don’t really translate to sportiness, though. Despite the feedback coming from the suspension to the seats, the steering is completely devoid of feel and doesn’t have much weight. The handling, however, is good. There is almost no on-center slop, and the car goes exactly where it is told. In fact, this is probably the easiest to pinpoint big car that I’ve ever driven. At low speeds it is incredibly easy to place and to park, and at higher speeds it tracks very, very well. Coupled with the good driving position and visibility I felt confident driving the Passat within a minute or two unlike the half hour or so adjustment I need with most rentals. Unfortunately without good steering feel, the meh engine, and braindead transmission it just isn’t any fun to actually put that to use. Overall, the drive isn’t sporty enough to be a good trade for the firm and chatty suspension. Personally, I think VW should have gone all in on comfort and a softer ride. That being said, all of my potted plants, food trays, and passengers made it to their destinations just fine - it is perfectly tolerable, but nobody will get out and compliment it on being smooth. Another shot from the back seat - that is what you really should be buying this car for. So there are some good things and some not-so-good things about the Passat. 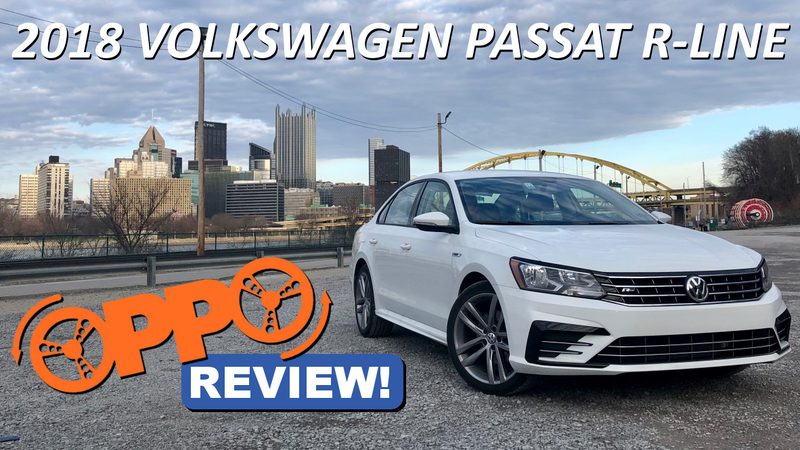 Compared to the rest of the class, without looking at price tags, it is easy to say that this aging Passat is clearly outclassed by its newer competitors and that buyers should avoid it. But we can’t just totally ignore price. For under $26k, you really do get a lot of car. Yes, literally, as it is pretty much the biggest thing in the class, but it also has some nice standard features that are extra options on the competition. For that price, it is worth being on a shopping list, but still not likely the best value. Here’s the thing, though: they don’t sell anywhere near MSRP. Dealers near me are knocking $7,000 or more off of new 2018 R-Lines. And that makes it definitely worth a look. For under $20k, this is a heck of a deal that would have me at least thinking about if spending $4k+ more on a mid-spec Accord or Camry was really worth it. If your priority is space and you don’t mind the chance that it could be less reliable than a Honda or Toyota long-term, definitely buy the Passat. A theme that emerged as I drove the Passat was that it simply feels like an American car imitating a German one. And really, that’s what it is. Born in America and built it America it has VW design cues, an attempt at a VW ride, and a bunch of corporate VW parts thrown at a big, bland midsize sedan typical of the type Detroit churned out by the millions before SUV’s took over. Despite looking like a big, four-door Golf inside and out at first glance, the Passat comes up well short of that upon closer inspection. With an uninspired drivetrain and busy ride without fun steering to match there isn’t a lot for the enthusiast here. Yet it handles well and offers good comfort and copious space for great price after discounts. Besides the transmission and some things that I personally don’t care for (like the lack of push-to-start), there isn’t anything truly bad about the Passat. I liked it more than the Optima that I had as a rental for three days just a few weeks prior. Despite its age, and not being a truly good car like the Golf, this Passat is still worth a look by anyone shopping for a midsize sedan - especially those who use the back seat and trunk regularly. Just maybe consider an SE or SEL instead of the R-Line to get climate vents in the rear. Not seen here are the confused looks on the faces of people waiting for the bus who were probably wondering why I was taking pictures of a common car in the middle of the parking lot.